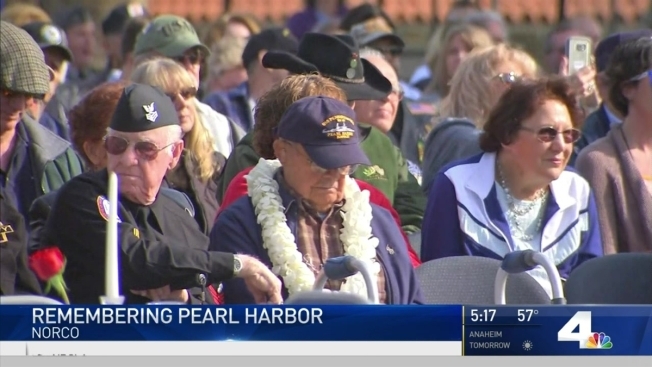 "If you saw my story [on the news] today, please, don't forget it," said Roger Marron, who survived the Pearl Harbor attack. As a reporter, it's my job to listen and tell people's stories. But, the story I am about to tell you is an important one, because it came from one of the few remaining Pearl Harbor survivors. Ten years ago, there were a dozen survivors at the annual memorial service in Norco, hosted by the U.S. Navy. This year, there were only two, both pushing 100 years old. Wednesday morning, Roger Marron, 96, tapped the seat to his right and invited me to sit with him, and that's when he began telling me his story. I was honored. On Dec. 7, 1941, Marron was a 21-year-old electrician mate with the U.S. Navy. He was from Santa Monica, but stationed at Pearl Harbor. "Morning of, I jumped out of bed. We were all ordered to head to take ammo... and head to the basement of the USS Pennsylvania. We could hear what was going on, but we couldn't see." "Were you scared?" I asked. He chuckled. "Surprisingly, not on that day. I was scared later on when I heard rumors that the Japanese might invade the island." Later that night, Marron and most of the 1,100 survivors went back to the barracks to sleep. "When I got back to my bunk, I noticed someone was sleeping in my bed. He was covered in oil," Marron said. "So, what did you do?" I asked. "I let him sleep. I went back to help care for the other survivors who were in worse shape than me. Helped them find clothes." "Wow," I said, in awe. He smiled at me. "Thank you, Roger," I said. "And not just for your service, but for being a good person." He thanked me for listening. I asked him if there was anything we could do for him, and he said yes. "If you saw my story [on the news] today, please, don't forget it." Oh, don't worry Roger. We won't.